A lifetime has passed since hundreds of thousands of Palestinians fled or were forced out their homes in the Mideast war over Israel's 1948 creation. Today, those who were uprooted and their descendants number more than 5 million people, scattered across the West Bank, Gaza Strip, Jordan, Syria and Lebanon. The Palestinian refugee problem is one of the most entrenched in the world, with a solution linked to an elusive Israeli-Palestinian peace deal. About one-third of the refugees still live in camps, or tent cities that have been transformed into crowded urban slums. Some families live in the camps for the fourth generation. The plight of millions of refugees everywhere is marked Friday on World Refugee Day. The United Nations refugee agency says that at the end of last year, more than 50 million people have been forced from their homes worldwide, the highest figure of displaced since World War II. More than 700,000 Palestinians fled or were driven out in the 1948 Mideast war, according to U.N. figures. The war began after Israel declared its independence and surrounding Arab nations invaded. Tens of thousands more Palestinians were displaced in the 1967 war in which Israel captured the West Bank, Gaza and east Jerusalem, lands the Palestinians seek for a state. The fate of the Palestinian refugees is one of the most explosive issues in the Israeli-Palestinian conflict, with Israel saying it cannot accept a mass return because that would dilute the state's Jewish majority. Palestinian negotiators say each refugee has the right to choose between return and resettling, whether in a future state of Palestine or a third country. In the Jenin camp in the northern West Bank, murals express the hardships of life in exile and the yearning to return to what is now Israel. Some old-timers there cling to hopes of return of going back. Fatimah Jalamneh, 85, spends her day sitting by the doorway of her house in an alley in the camp. She was in her late teens when her family fled from the village of Noures near what is now the Israeli town of Afula. "Until death takes me away, my only dream is to go back to my village and sit under a tree in my home which was taken away from me and my children," said Jalamneh, a great-grandmother. She had tears in her eyes when she spoke and held what she said was a key to her old family home. Al-Nursi was 4 years old when he and 19 relatives fled with just the clothes on their backs. "I won't let go of my right of return," he said. 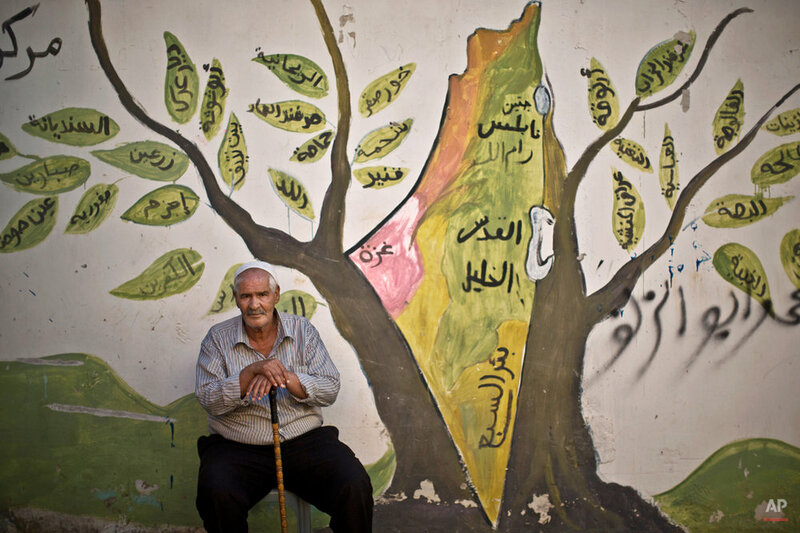 This series of images is by Associated Press photographer Muhammed Muheisen and are of some of the oldest Palestinian refugees in the Jenin refugee camp in the northern West Bank on World Refugee Day.